You may be wondering why sound recording software? Many a time you find yourself regretting not having recorded either an important class lecture or an important business, or missed an opportunity to record that call from your loved one. As the Best Sound Recorder Software, Free Sound Recorder presents you with a wide range of easy options for recording audio, so you have no excuse for not doing so. 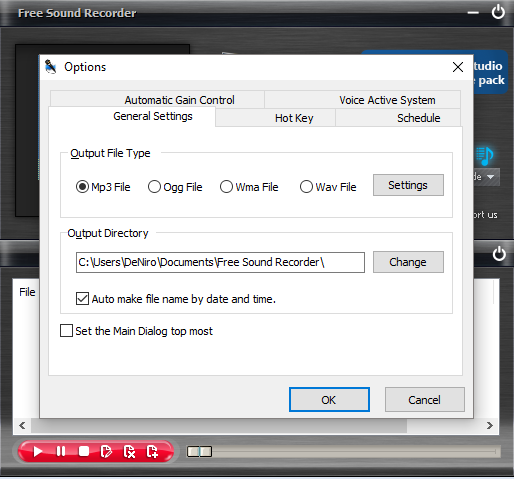 Free Sound Recorder, just as the name suggests, is a FREE audio recorder with the ability to capture various sound input to MP3, Ogg, WMA and WAV formats. Also, the sound recording utility is fit for recording from line in, CD player, amplifier, web radio and anything you can get notification from your PC. As a voice recorder, it can likewise record human voice from microphone. A good recording software comes with additional recording features so you are able to get your audio files from the input and burned successfully. 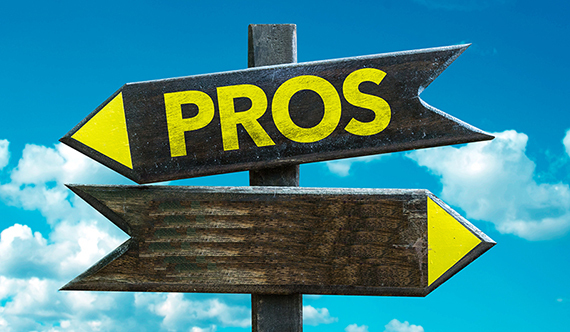 Having recording schedulers makes it possible to pre-schedule an upcoming recording session. You can use burn tools to save files to optical media for storage as well as playback. Apart from recording audio files, you might want to improve the quality of the recorded files by carrying out simple edits, for instance, trim the audio file. There is no point having a recorder that cannot play your audio files. Most voice recording programs support MP3, WMA, WAV and Ogg. 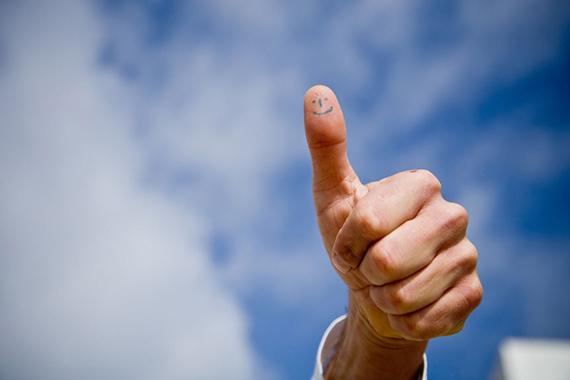 However, some go an extra mile and support additional file types. Recording sound is an activity that should be as simple as 1, 2, 3. 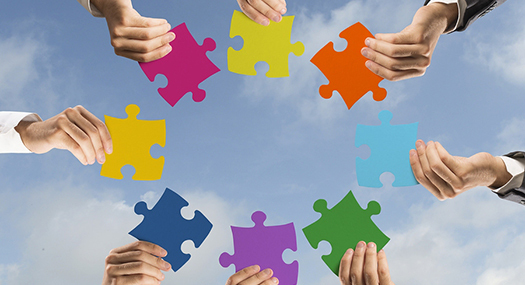 The ease should be from installation to implementation of the actual recording exercise. A good voice recording software should provide multiple sources for voice capture such as internet streaming, VCD, tube streaming, phone recording, internet radio and recording calls among others. You can choose the file quality and size. Directly link to run Sound Editor software to edit the recording you just created. It allows you to perform regular editing for instance mix ,trim, cut, copy, paste and lots of amazing audio effects as well as filters which can be applied like Reverse, fade in and out, echo, Amplify, and Normalize just to mention a few. Free Sound Recorder is designed to record sound from any audio source you could possibly find, this includes mic, stereo, line-in, online streaming, LP/cassette/CD/VHS player, VoIP or Conference conversation, softphones like Skype & Express Talk, as well as all popular media players like Windows Media Player, Real Audio, QuickTime and more. Whatever you hear, you can grab them to save in your audio library and enjoy on any computer or portable player. Free Sound Recorder has the most recent sound encoder incorporated as well as the exclusive clamor concealment frameworks which help to keep up prevalent sound quality. You can use preset to easily control the output by dragging a slider; if you are experts with a higher requirement on quality, the manual adjustment will always bring a more meticulous result. Sound recording has never been this fun! Free Sound Recorder has a sound recording scheduler so you can set the Once/Daily/Weekly schedule to record from your preferred sources that run at a specified time. Free Sound Recorder allows you to record your audio in three simple steps: choose a sound source, start the sound and record! Sound recordings are added to a file list where you can easily manage and play them back. The file list is also linked to our sound editor, which can be launched directly. Automatic Gain Control is a feature that functions to balance the volume of the recordings. Voice Activation System, on the other hand, is designed to start recording when hearing a voice and skip silent passages. 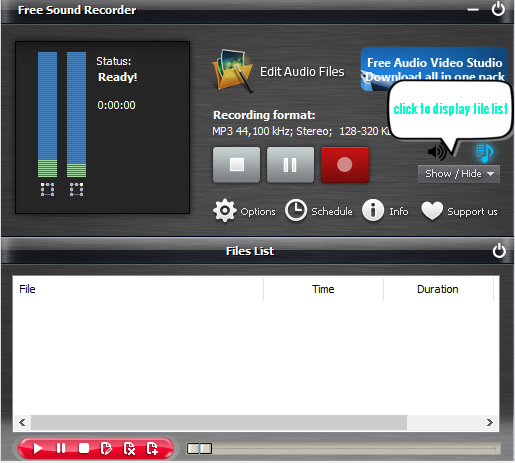 Free Sound Recorder is absolutely free and requires no registration. It is fully functional without limitation and comes with NO form of malware or adware. 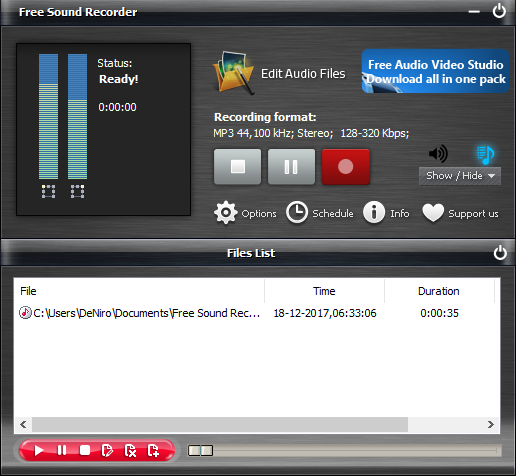 Step 1: Launch Free Sound Recorder, click Show/Hide to display the file list. Step 2: Click Options to adjust the recording settings, under general settings, select your preferred output format from the Output File Type namely MP3, Ogg, Wma and Wav respectively. For well-configured presets, click Settings and adjust the recording quality of your choice. Click Change to choose an output folder, otherwise, the file will be auto-named based on date and time the recording took place. Step 3: It is now time to start recording, click Start Recording to start and click Stop Recording to stop. Once you stop recording, the recorded file will output to the output folder and listed in the file list with detailed information such as location, time, duration and filename. Use a built-in player to play the recording. Note that the quality of a sound recording is maintained through the various stages of recording, editing and burning, failure to which the result is compromised and in some cases the sound recording could be rendered incomprehensible and inaudible. With the ample features and tools, it comes with, Free Sound recorder is your best bet. This best Sound recorder software makes sound recording and digitization a breeze and a lot more fun. With that said I can confidently assert that Free Sound Recorder is the best sound recorder in 2018, try it today.